We are off visiting children and grandchildren in Hong Kong. This includes a beach stop at Gili Trawangan Island off Bali (actually Lomboc Island). How far to come to be reminded of Hudson. 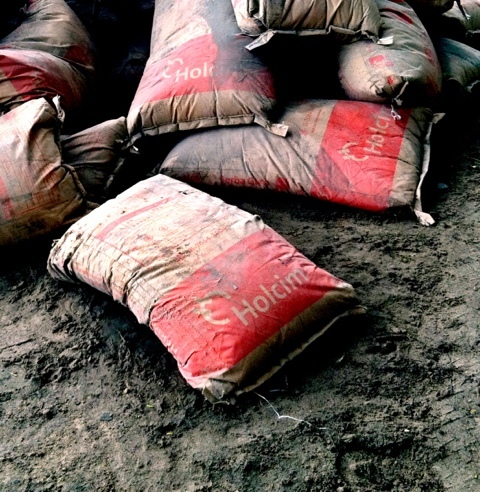 Here are bags of Holcim cement being delivered on the beach with steel and other construction materials. Mayor Scalera’s commentary, “Naive or delaying LWRP passage?” in today’s Register Star requires some comment. Here are my comments posted on the Register Star website. First, Mayor Scalera mis-characterizes the potential uses of the waterfront as “recreational boating and perhaps some limited shipping….”. In fact, from my perspective, and from all of the people I have heard talk about the waterfront, the uses included recreational boating, cruise operations, hotel, restaurants, retail shopping stores, galleries, and more. These uses fit into a larger picture that the future of jobs in Hudson is tied to the extension of the city as an arts, antiques, entertainment, and history destination. This job creation engine has a track record in the city and an obvious future for growth with the addition of the waterfront as part of the overall destination package. The problem is that none of that is possible with a large scale industrial use cheek and jowl with the rest of the waterfront. The choice we are facing is a trade off between a limited number of seasonal jobs hauling gravel (it was reported elsewhere in today’s Register Star that Calarusso only operates during non-winter months) or developing the track the city has been on for the past 10 to 15 years, becoming a destination for those interested in arts, antiques, entertainment, food and history. I want to place my bet with that development path. A second point might be to point out that Mayor Scalera went to lengths to point out the Open Space Institute and Scenic Hudson would not support an eminent domain taking. That is not the only way in which those organizations might be involved. A simpler path is the old-fashioned one of buying the land in question. As someone who has only lived in Hudson for a year and half of the twenty three years of the LWRP process, it seems wise to continue to get the policies right even at the cost of a bit more time.